The Sea Dogs fell behind from the start of a tough game against Reading as the Fightin Phils scored three runs in the first inning and knocked Portland starter Teddy Stankiewicz out of the game. Stankiewicz recorded only two outs, allowing three runs on four hits and two walks. Ben Taylor threw 3 1/3 innings of relief, allowing two runs on two hits and a walk, striking out four. Ty Buttrey allowed three runs in three innings and left-hander Luis Ysla tossed two perfect frames, striking out three to close out the game. Second baseman Tzu-Wei Lin led off the bottom of the first with a home run but the Sea Dogs bats were unable to compete with Reading's offensive outburst. Mauricio Dubon was 2 for 5 with a two-run single in the fifth as he's gotten off to a quick start in his first two games against Double-A competition. Tim Roberson was 2 for 4 with a run and two doubles. Andrew Benintendi was 0 for 3 with a walk. The Red Sox and Keys resumed Thursday night's game which had been suspended with the Keys leading 1-0 in the second inning. The Keys continued to pile onto their lead on Saturday night, scoring three runs on eight hits against Travis Lakins, who threw three innings and struck out a batter, walking none. German Taveras was dominant in relief, tossing four innings and allowing just a run on a hit and a walk and fanning four. Salem's bats were relatively silent on Saturday night, scoring only once on a solo shot by Deiner Lopez in the seventh inning. However, Salem's corner infielders were some bright spots, though, as both third baseman Rafael Devers was 2 for 4 with a double and first baseman Nick Longhi went 2 for 4. Daniel McGrath was excellent on the mound for the Red Sox, throwing a seven-inning complete game and allowing just a run on five hits. He walked one and struck out five, lowering his ERA to 4.75 in 36 innings pitched this season. Salem scored their first run on an RBI double by Jose Sermo, scoring Jordan Betts. The winning run came in via an RBI single by Devers in the fifth inning, scoring Ben Moore. Anderson Espinoza started on the hill for the Drive and turned in a strong performance. He lasted just 4 2/3 innings but gave up just a run on three hits and a walk while striking out two batters, dropping his ERA to 3.90 this season. Marc Brakeman pitched 2 1/3 innings of relief, allowing three runs on four hits, striking out four and walking one. Austin Glorius finished the game with two innings, allowing a run on a hit and a walk, punching out two. The Drive scored their first run in the fifth on an RBI single by Tyler Spoon to drive in Mitchell Gunsolus. Their final two runs came via a two-run double by Kyri Washington in the ninth which scored Luis Alejandro Basabe and Chad De La Guerra. The Spinners continued their excellent start by winning their ninth straight game to begin the season and scoring nine runs in a big game for the lineup. They got out of the gate with a fantastic start, scoring seven runs in the first inning and capping the rally with a two-run double by Tucker Tubbs and a two-run homer by Carlos Tovar. Tubbs put on a show for Lowell on Saturday night, going 3 for 4 with two runs, a double, a homer, and four RBI. Catcher Roldani Baldwin was 2 for 3 with a walk, a double, a triple, a run, and an RBI. Kevin Steen made the start for Lowell but it wasn't his best effort as he allowed three runs and walked four batters in four innings. Brad Stone threw 1 2/3 quality innings of relief, allowing no runs or hits with two strikeouts and two walks, earning the win. Kuehl McEachern tossed 3 1/3 shutout innings, allowing four hits and striking out two. The GCL Red Sox picked up their first win of the season with a shutout victory on Saturday. Jacob Dahlstrand started on the mound, throwing 3 2/3 scoreless innings, allowing two hits, two walks, and racking up six strikeouts. The bullpen was excellent for the Red Sox as Jordan Weems (1/3 of an inning), Victor Garcia (three innings), Jorge Marban (one inning), and Nicolo Clemente (one inning) ended the game with 5 1/3 innings of hitless relief. The GCL Sox scored their first run when Marino Campana scored on a double play in the second inning. Their next run came on an RBI double by Yomar Valentin, scoring Juan Barriento. The third run came when Valentin crossed the plate on a passed ball in the seventh. Ritzi Mendoza earned the win with a solid start on Saturday, lasting five innings and allowing two runs on two hits and two walks, punching out five. Oddanier Mosqueda followed him with three dominant hitless innings, striking out five and walking one. William Caraballo pitched a scoreless ninth inning, giving up a hit and a walk and striking out one. Catcher Eddy Reynoso was the offensive standout, going 2 for 5 with a two-run double in the third. Luis Hernandez and Willis Figueroa were both 2 for 3 with a walk, with Figueroa also contributing an RBI. Strong starting pitching was a theme for the Red Sox DSL affiliates as Red Sox2 starter Bryan Mata tossed five shutout frames, allowing three hits and one walk while punching out four. Andres Jimenez and Joan Martinez each threw two innings to end the game, with Jimenez allowing an unearned run. Second baseman Everlouis Lozada was 2 for 4 with a solo home run in the third and a two-run single in the eighth. Albert Guaimaro was 2 for 3 with a double, a walk, and an RBI. 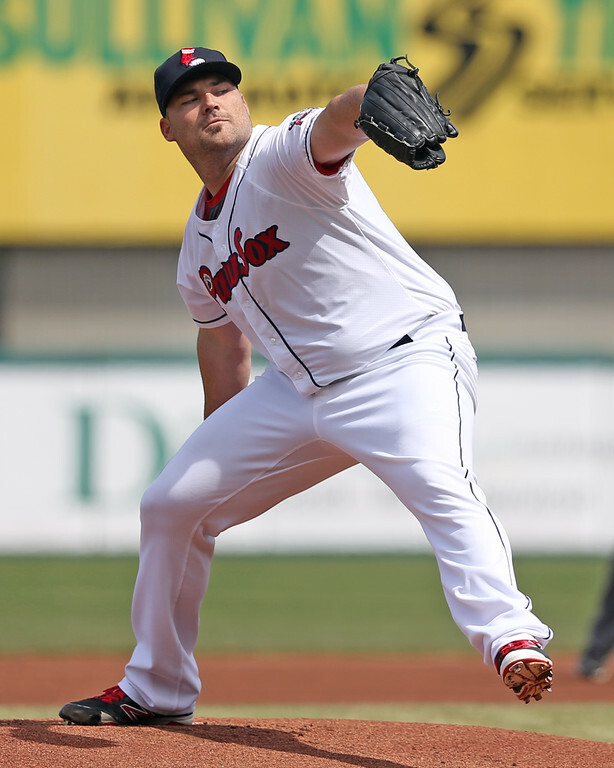 Player of the Night: Sean O'Sullivan spun a gem for the PawSox on Saturday night. He tossed seven shutout innings, allowing just four hits and walking none while punching out six batters. O'Sullivan is having a strong first season in the Red Sox organization, pitching to a 2.79 ERA in 71 innings with a 51/10 K/BB with Pawtucket.